Seattle is one of those rare places where it isn’t considered droll to talk about the weather. The SAM Gallery artists in Color Excursion, on view December 8 through January 7, offer an escape from grey days into exuberant artwork. Below, three of the artists in this show share the ways that living in Seattle and the surrounding area impact the way they see the world. For such a moody and dramatic locale, you may be surprised by their vibrant, lively work. If you’re looking to recharge your senses, come to SAM Gallery for the Color Excursion Opening Reception on Thursday December 7, talk to the artists about their work, and find out how you can rent or buy artwork from SAM Gallery. This year I moved from Green Lake to Whidbey Island. Previously my work originated from a contemplative state of creation. I found inspiration through travel and memory and emotions but now living on Whidbey, I’m in it. On the island your surroundings are constantly in flux. The winds whip in and carry things away, the storms batter the shoreline leaving treasures on the beach. The nights are deep and dark and full of creatures. Everything feels alive and in a state of change. The beauty and the drama of my surroundings constantly barrage my eyes and fill my brain with endless creative ideas and the solitude of the island allows these ideas to come to fruition in my studio. When invited to make a body of work for Color Excursion, I was elated. I’m addicted to color. I mix my own colors using wax and powdered pigments and when working with this medium it becomes something else, something more tactile. It’s hard to explain, it’s like I’m making a soup but I’m loading it with saturated color until it’s thick, and I want to eat it. That’s what initially drew me to encaustic painting and I think it’s what draws people to want to touch an encaustic painting. The use of color in my work is an unapologetic form of escapism from the long stretches of grey weather that continually blankets my Pacific Northwest home. Each year my palette of luminous, unnatural hues provides a defiant objection to winter’s approach. Pulsing fluorescent paints massage the naked eye with ultraviolet light, creating an energized glow impervious to dull environments. Maroon does not belong to me. Tubes of brown remain unopened. There is safety in muteness. My paintings speak to extroversion, experimentation, and play. Through color, I aim to activate. Color Excursion immediately brought to mind the idea of travel, taking an excursion lavish with color. My work in this show was inspired by a trip to South America one year ago. Although the paintings for this show do not reflect Seattle, much of my work is inspired by my daily routines and surroundings. For example, the Across the Lake, Cloud Dreams, Inside a Cloud, and Inside a Leaf series are all the result of my daily walks in my Seattle neighborhood. 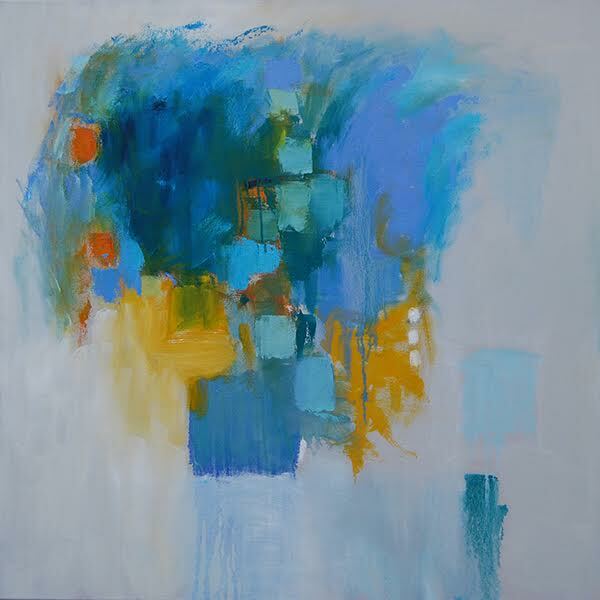 I let my experiences germinate and then abstract them on the canvas, translating a memory of a place or an experience. I work in layers of color and compose the image while working. My paintings are oil on canvas or board. Working with oil means that each layer needs to have a bit of time to dry before the next layer can be applied. I find that when I return to the piece it changes and evolves in surprising ways. 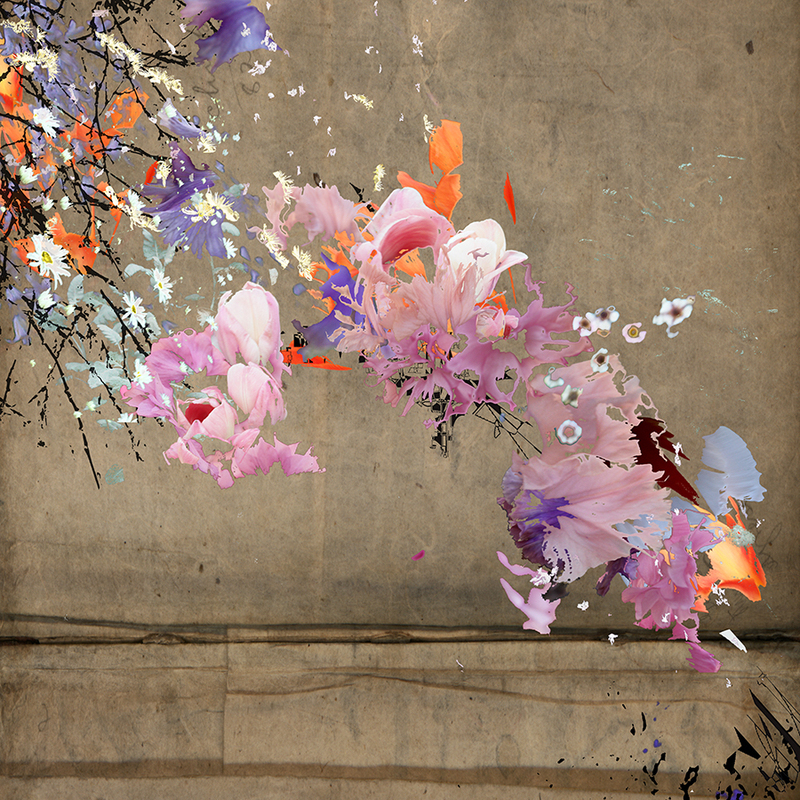 This new work at SAM Gallery is from a series of unique digital mixed media prints called the Gardeners Journal. The nature of the Northwest has always been a part of my life having grown up in eastern Washington. With this body of work, it becomes a touchstone away from the tech-focused culture of our evolving city. My digital print studio keeps me in front of a computer monitor much of the time. As a retreat from the stream of social media I find refuge out my window, a slight turn of the head away from the monitor. I have found the organic shapes and colors of my garden to be a creative counterpoint to the drone of data. By exploring abstracted shapes and forms found in nature, this new work provides endless metaphors and narratives and visually blend the creative tools of traditional art making with new digital possibilities to find a balanced voice in the moods and aesthetics of the region. 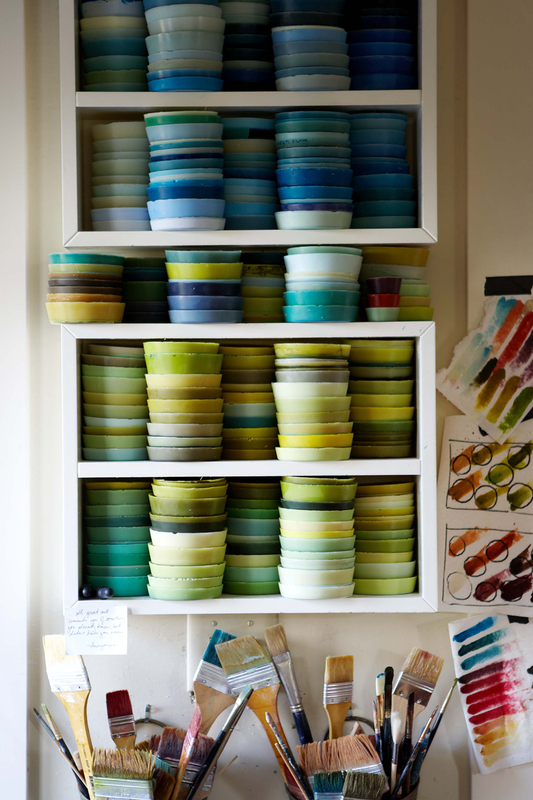 Images: Detail of Leslie Stoner’s studio, photo: Alison Blomgren. Afterglow Two, Liz Tran, 30 x 24 in., mixed media on panel. Easter Island, Chile, Sheryl Westergreen, 36 x 36 in., oil on canvas. 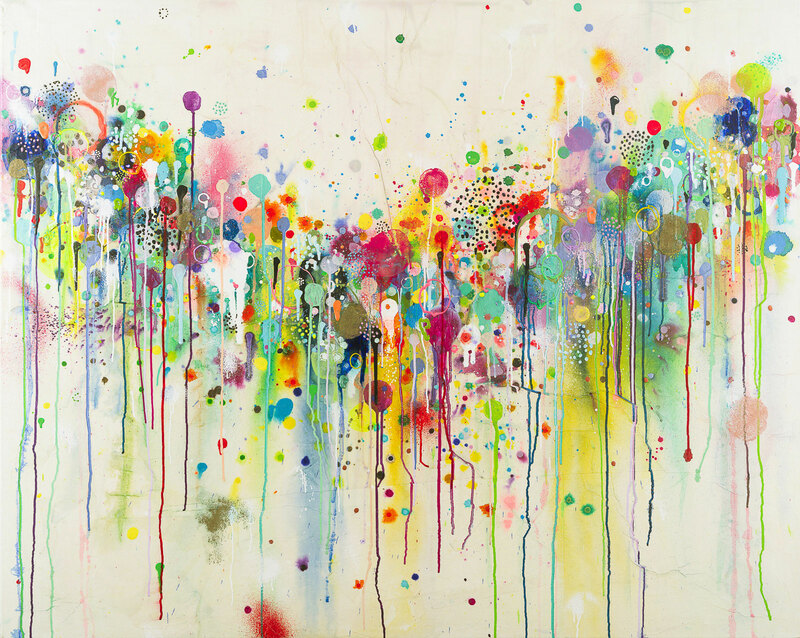 Like a garden splashed across the landscape, Stephen Rock, 36 x 36 in., pigmented print, watercolor, gouache.